In one of the matches identified by Bethlehem Steel head coach Brendan Burke as essential for providing points to Bethlehem Steel FC in their attempt to recover from a sub-par month of July, Bethlehem scored three goals in the second half, keeper Jake McGuire earned his first 2018 clean sheet, and the Steel secured three points on the road. The scoreless first half saw two excellent early scoring opportunities, one for each side. Bethlehem had an excellent shot by Santi Moar off a free kick in the first minute. Then, off a cross in from Richmond defensive center mid Braedon Troyer, attacking center mid Brian Shriver put a thunderous header on goal from well inside the spot but Jake McGuire’s reflexes brought his right arm up in time to meet the challenge. Neither side established control of central midfield in the center channel, until Bethlehem began to focus on doing so in the second half. Olivier Mbaizo was dangerous down the right channel the entire game. The Cameroonian was constantly unmarked when he moved forward, as Richmond did not display the defensive discipline called for by flank midfielders in a 4-2-3-1. He assisted Omar Holness in the 79th minute and Michee Ngalina in the 85th. The psychology of losing showed strongly among the Kickers. Once the penalty kick in the second minute of stoppage time of the first half was disallowed after consultation with the assistant referee, and coach Burke made some halftime tactical adjustments, Richmond seemed to lose fire from their collective belly. The Virginians looked mentally finished when Chris Nanco did everything to create Santi Moar’s icebreaker in the 54th minute by a run to the right endline corner of the box that turned the Richmond defender inside out, and then laid back for the Spaniard to side-foot it easily past a helpless keeper. Omar Holness came on in the 78th for a deserving Nanco and iced the match a minute later on a nice cross to the far post from Mbaizo. Michee Ngalina put the frosting on the cake from Mbaizo in the 85th. While Chris Nanco deserves every credit for allowing Moar to take the lead, McGuire secured his first clean sheet on the basis of several excellent saves, including one of pure reflex in the seventh minute from close range. He and his entire defense deserve full credit for the road clean sheet. Bethlehem next play Wednesday night in Charlotte against the Independence. Bethlehem sit at ninth place in the table, tied with eighth place Ottawa on points with 30 but behind with one fewer win. Charlotte are in 10th with 28 points. The old-fashioned version of VAR: The first half ended with Richmond being given a penalty kick in the second minute of stoppage time, but the call was then overturned after consultation with the Assistant Referee. New: This is the first time Bethlehem has faced Richmond without Leigh Cowlishaw as the Kickers coach. David Bulow, in addition to evaluating his roster, is implementing a different style of play with defensive pressure higher up the field, attempts to possess the ball and build out of the back, and clear attempts to rebuild a positive mindset. 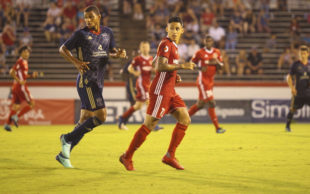 Pressure creates diamonds: Aidan Apodaca seems to be rounding into the form he showed early in preseason against much lesser opponents. He has recovered fully from two hamstring issues and has internalized the Bethlehem/Union way of doing things. He is being pushed by Faris, and is in his turn pushing Faris. Tonight he was more effective than the young Cameroonian defensively, and was unlucky not to get one of his shots on goal. Jake McGuire*; Olivier Mbaizo, Matt Mahoney, Brandon Aubrey, Matt Real*; James Chambers, Drew Skundrich; Santi Moar, Brenden Aaronson** (Omar Holness 76’), Chris Nanco (Faris 71’); Aiden Apodaca (Michee Ngalina 60’). Unused Substitutes: Tomas Romero**; Ben Ofeimu**, Prosper Chiluya, Mike Catalano. Trevor Spangenberg; Scott Thomsen, Evan Lee, Mallan Roberts, Alex Lee; Greg Boehme (Brandon Eaton 74’), Braeden Troyer (Koby Osei-Wusu 80’); Raul Gonzalez, Luis Fernando, Giuseppe Gentile (Yudai Imura ’68); Brian Shriver. Unused Substitutes: Kent Dickey; Mekeil Williams, Neil Hlavaty, Austin Yearwood.